Info "Keep Fox on target!" 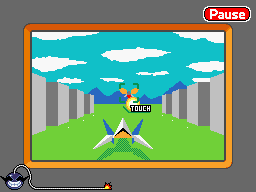 Star Fox (known as Starwing in the European and Australian versions) is one of 9-Volt's microgames in WarioWare: D.I.Y. This microgame is based on the Super Nintendo game Star Fox. The point of the game is to destroy the incoming enemy ship by controlling Fox McCloud inside his Arwing. An enemy is heading towards the ship and the player needs to tap the screen to fire a bullet. The player needs to tap the enemy when it's in range to destroy it. If the player destroys the enemy, the game is won; however, if the enemy touches Fox's ship, the game ends in a loss. This page was last edited on July 16, 2018, at 12:29.